The RunnerDuck Wooden Decorative Candles, step by step instructions. Here's another fun family project from the wood shop. These candles make nice gifts and help decorate the house. (3) 3/4" square pieces of Pine 6" to 12" long or 3/4" dowel. 3/4" piece of Pine 6" to 8" square. Cut the (3) 3/4" square pieces of pine or dowel to approximately 8", 9 1/2" and 11". Round the edges using a router or sand paper. 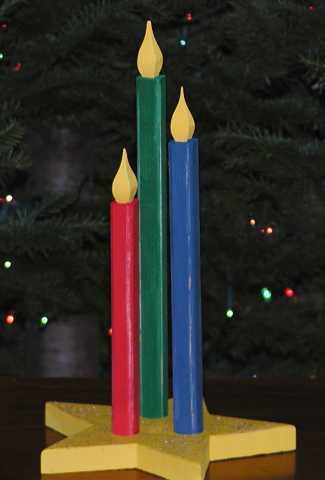 Using a band saw or scroll saw, cut the flames on top of each candle. These actually look better if they are a little off center and each one is different. Transfer the pattern and cut out the Star Base using the 6" pattern at www.runnerduck.com/images/star_base_6.gif or the 8" pattern at www.runnerduck.com/images/star_base_8.gif. You can drill three holes in the base for the candles to sit in or just screw the candles to the base if you don't have a large enough drill. Paint the candles with acrylic paint. Make them look as real as you can using orange and yellow for the flame. Paint the candles any color you like. Paint the base to compliment the candles. I think those would make a very nice gift for family or friends. Make several and set them around the house for decoration.